Located in Léognan, capital of the Graves, Domaine de Chevalier’s history goes back a very long way. It is listed under the name “Chibaley” (meaning chevalier, or knight, in Gascon) on the map drawn by the engineer Pierre de Belleyme in 1763. The Bernard family, major players in the French spirits industry and important shippers of great Bordeaux wines, acquired the estate in 1983. Domaine de Chevalier has been managed since that date by Olivier Bernard, who takes great efforts to maintain the spirit of balance and search for perfection that has guided production at this superb estate for over 130 years. Domaine de Chevalier’s red wine, one of the standard bearers of the Pessac-Léognan appellation, is an elite member of the Bordeaux great growths. 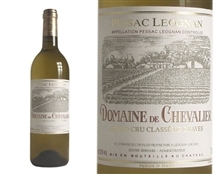 White Domaine de Chevalier has remarkable ageing potential and is recognized far and wide as one of the greatest dry white wines in the world.